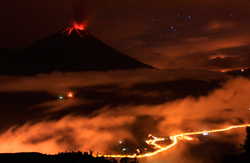 South of Quito, located on the northern foothills of the Tungurahua volcano lays Baños, a city named after the hydrothermal springs located around it. Known as the gateway to the Amazon Basin it has a beautiful setting and pleasurable subtropical climate gifted with orchids, incredible waterfalls and hot springs. The history of this city is intimately linked with its unique geology. The Avenue of the Volcanoes, as it was called by explorer Alexander Von Humboldt, is a breathtaking passage in the Andes, surrounded by gigantic mountains and colossal volcanoes. On this fascinating tour, we will visit part of the Avenue of the Volcanoes and do a short hike in the protected areas surrounding one of the highest active volcanoes in the world – Cotopaxi. We will then visit one of Ecuador wonders, Baños de Agua Santa, a seemingly magical town, where nature is the protagonist in an adventure that will last for a lifetime. The excursion begins when a representative picks you up from your hotel – from here, we will drive south to the looming Avenue of the Volcanoes. Our first stop will be Cotopaxi National Park, home of one of the world's highest active stratovolcanoes, Cotopaxi Volcano. Surrounding this volcano, we will find the gorgeous Andean paramo, an ecosystem characteristic of the Andean highlands, where incredible animals like the Andean condor, spectacled bears, and many others (like rabbits, deer and a wide variety of birds) have adapted their lives. 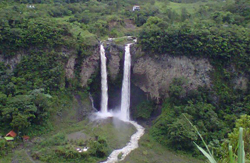 We will do some trekking in the area and enjoy the beauty of this unique national park. 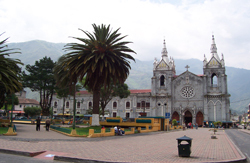 We will have lunch close by and continue our journey south to a very different and unique town – Baños de Agua Santa. Very few places have life as vibrant as in Baños, surrounded by incredible landscapes, spectacular waterfalls, and unparalleled forests. Baños has charmed visitors from all over the world. We will spend the night in this quaint adventure town. In the morning, after a hearty breakfast, we will explore the spectacular nature that surrounds Baños. 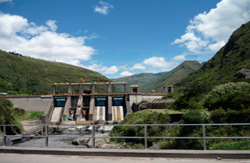 We will start our tour by visiting the impressive Agoyan Dam, and we will bear witness to the impressive power of this waterfall, contained by a hydroelectric dam. 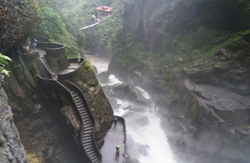 We will then visit one of the most amazing visitor's sites of Baños, El Pailón del Diablo (the Devil's Cauldron) – an impressive waterfall with a drop of approximately 80 meters (260 feet) that releases an incredible amount of energy as the water crashes against the stone walls that surround it and create a deafening roar. It is an marvel without match. After these visits, we will enjoy the distinct Sierra cuisine at lunch in a local restaurant. 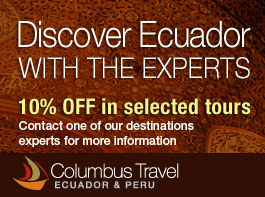 Later on, we will return to the city of Quito.